There’s so much happening in the world – mostly driven by the digital revolution – that it’s easy to get so wrapped up with new tools and channels that the fundamentals are left behind. Strategy is one of those areas that is often neglected. And even when, like me, you’ve done an MBA and keep an eye on the latest thinking in the business schools and media it’s good to set aside some time to step back and take a fresh look at your approach to developing strategy. 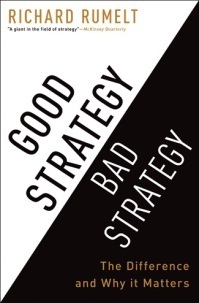 Early on the author tells us the kernel of a good strategy: A diagnosis, a guiding policy and coherent action. A coherent strategy co-ordinates policies and actions and creates new strengths through subtle shifts in viewpoint. Thus it combines analytical and creative skills. “The most basic idea of strategy is the application of strength against weakness – or, strength applied to the most promising opportunity”. Herein lies that most tricky parts of strategy – looking at things from a different or fresh perspective, uncovering the hidden power in situations or challenging conventional wisdom. He effectively asks us to redefine and reframe. Professional service firms would do well to note his advice: “Strategy involves focus and, therefore, choice…any coherent strategy pushes resources toward some ends and away from others”. A key challenge for the professions that one. He drives the point home with “Most complex organisations spread rather than concentrate resources, acting to placate and pay off internal and external issues”. He mentions some research where he asks business leaders about the formula for success in their sectors, and most knew this but none said it was their focus or even mentioned it as part of their strategy. He identifies the four indicators of bad strategy (fluff, failure to face the challenge, mistaking goals for strategy and bad strategic objectives). I liked his analysis of inertia and entropy (a particular challenge for the professions until recently) from the lack of anticipation and creativity. Following the route of the MBA method of teaching, the book is studded with case studies, some with the benefit of discussions in the classroom and others from consulting situations. Sectors include technology (Apple, DEC, NEC, Nvidia, Xerox, Intel, Cisco, AT&T, Tivo), retail (Walmart, Starbucks, Ikea), energy (Enron, Shell International), entertainment (Disney), manufacturing (International Harvester, Ford, General Motors), transport (Crown Cork & Seal, US airlines), telecommunications (Telecom Italia), public sector (US Defence Department, NASA) as well as small, family business examples, military examples such as Desert Storm and even from the Bible (David vs Goliath). The final chapters examine the building blocks of a good strategy: intelligent anticipation, guiding policy that reduces complexity, the power of design, focus, using advantage, riding a dynamic wave and inertia and entropy amongst rivals through a case study of Nvidia, an electronic chip manufacturer. 4. Why so much bad strategy?